Relaxation and water are the two words that make me think of a nice bath after a long day. Lighting up a few candles, pouring yourself a glass of your favorite wine and soaking in the hot bubbles is enough to make anyone wash away the stress of the day. If your bathroom is lacking bathtub storage like mine, this DIY bathtub shelf will come in handy. When you're not using it as a bathtub shelf, use it as a bench to sit on when showering. I started off with measuring the width of my tub…came out to about 3ft. I went to my local hardware store and purchased a 6ft Pine board for $8. I had an employee cut the board to the size I needed. I ended up with two 3ft boards. Next, I knew the wood would be exposed to moisture (since it's in the bathroom ) so I purchased a clear satin finish sealer. I didn't want to stain my shelf since I was going to surface burn it for a visual effect. Surface burn- when you apply heat to the top of a wooden board, going along the grain to achieve a burned effect. Feel free to stain your board any color that works with your bathroom. *** Make sure to do this project outside. There is sanding and burning involved. Since I was going for the rustic look I needed to distress the fresh cut boards. I used the supplies below to shape the board. I used the knife to shave off the edges of the boards. The pliers and screw driver were used to make “nail” holes and aged distress. After I was satisfied with the general shape of the boards, I sanded down any sharp edges and smoothed out the top. *** Make sure to wipe down the boards with a damp cloth after sanding to remove the dust. It will help the sealer adhere to the surface. ( you can get them for 89 cents at the paint section) and with a light stroke brush on the sealer. Wait about an hour or until the sealer is tacky to paint on another layer. This will help the second coat to adhere in a smooth transition. Wait for the board to dry completely before sanding down any rough surfaces. Here are the supplies I used to achieve the final look. Since the board produced 2 shelfs feel free to gift one. Let us know what you think and leave a comment. Show us your own creations by tagging us on Instagram @dennison_dampier and like us on Facebook. I wish the photo above was my actual closet...who doesn't ?! With the cold months rolling in it is time to swap your summer clothes for the sweater weather. Cleaning out your closet when season changes is a great way to stay closet clutter free. Start off with 2 bins, storage and donation. Go though your closet thoroughly. In your closet keep, dresses that can be layered and worn on cooler days. Shirts, that can also be layered under a sweater. The rest of your Summer attire can be separated between the 2 bins. Evaluate each piece and decide whether you will wear it next year. My suggestion is to keep the pieces that held up well with frequent use. Chances are you will wear them again. Any piece that has seen better days can go in the donate pile. Ask us question, we love to give you tips and suggestions as well as read yours. Let us know how you like this weeks Organization 101 post. Tag us in your Fall cleaning on Instagram @dennison_dampier and like us on Facebook. ​Stay tuned for an easy DIY project coming soon. 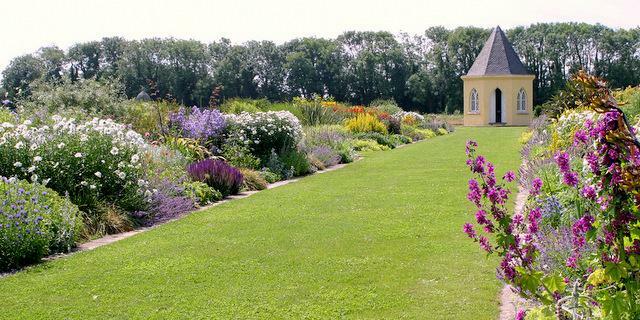 On this weeks Garden Buzz, here is a magical place everyone should visit on their next trip to Ireland. Talk about detail! 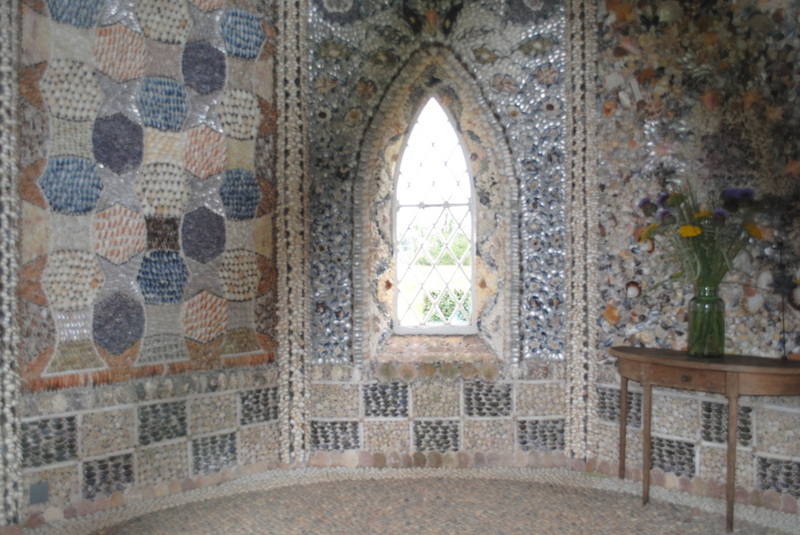 ​Everything in this little house has been tiled with shells. Take a look and let us know what you think. Would this be a place you would love to see? Let us know what you think in the comments. Keep in touch and follow us on Instagram @dennison_dampier and like us on Facebook. One way to keep the Summer spirit alive during these cooler months is to display those beautiful sea shells you found during your many trips to the beach. These crafts are fairly easy and inexpensive. All you need is a hot glue gun and some hot glue sticks. Some of these do require a bit of time, do it on a rainy day. Start off by cleaning out all the sand and grit from your shells. Best way to go about that is to run them in the dishwasher on your next cycle. With the Holidays coming up, here are a few personalized stocking stuffers using sea shells. Candles- Take apart tea light candles and glue the wick to the bottom of the shell. Melt the remaining wax and pour into the shell letting it cool. You can make dozens of these at zero to no cost. You can always add a few drops of essential oils to the melted wax. Place a few sea candles into ornate baggies and use as gifts or party favors. Jewelry Bowls- After you wash the shells and wipe them dry go ahead and spray paint them with a metallic finish for an upscale look. Each shell is unique and will be that much more interesting as a gift. This decor item can cost up to $75 at a boutique, you can make it yourself with a seven dollar can of spray paint. Add personalized notes or quotes to the inside of the shell. 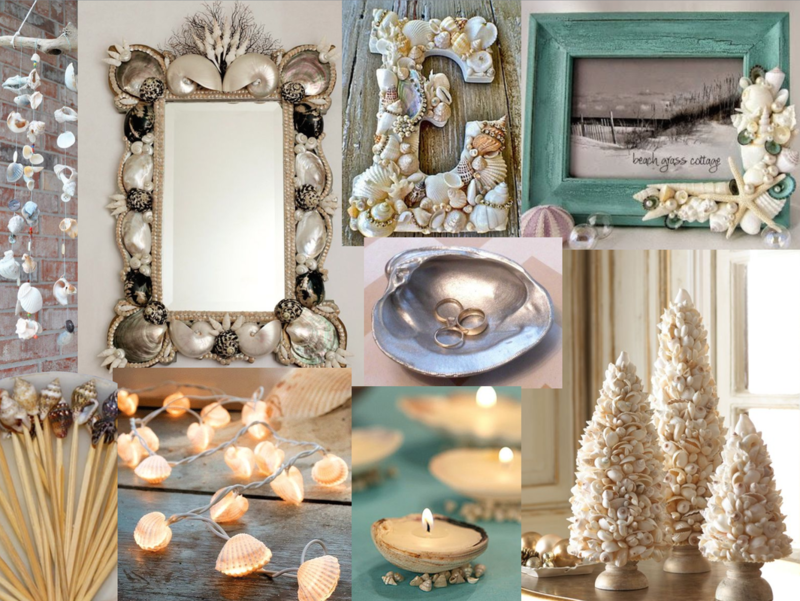 Accent Decor- Use smaller shells to create a beachy Christmas tree. Purchase a foam cone from your local craft store and hot glue the shells around the entire cone focusing on creating the tree shape. You can glue on a wooden or glass pedestal (like a candle stick holder) to give it a nice finish. Magnets- Pretty self explanatory…Glue magnets to shells and use them on your fridge or any metal surfaces. Great for coworker gifts because you can stick them to metal file cabinets. Mirror- Embellish a plain mirror with your beach finds to give it a unique look. Get as creative as you'd like with this one. There is no wrong or right. Dont forget to share your creations with us by tagging us on Instagram @dennison_dampier or Facebook. Leave a comment and let us know what you think. We love feedback! These little rods can have a powerful impact on your homes organization if you use them in the right areas. The best thing about these, they are adjustable, making them the perfect size for any crevice of your home. Here are 8 ways you can use tension rods in your home. Mini Herb Garden- Whether you live in an apartment or simply have a yard not big enough for a garden, you can use these to plant herbs upward. Attach rods to the window area and hang small planters for a space saving garden. You can even use this idea above a kitchen sink to maximize storage. Cabinet Storage- If you want to read more about under sink organization, refer back to our September 5th post. A tension rod creates a practical storage solution in cabinets. You can hang cleaning supplies from it or store a paper towel for a quick grab. I use a tension rod under my kitchen cabinet for an easy garbage bag storage. It comes in a roll which I hang from the rod. Pantry Solution- Perfect when storing cookie and pizza sheets in the pantry. Just attach the rods in between shelves in a vertical position spacing them out to fit the tin sheets. Extra cutting boards and cooking pot lids can also be stored using this system. Clever Shoe Storage- Great solution for a small closet. It really helps maximize the space. Use the rods in a small area of your closet, attaching them close to the back wall. Place your shoes heel against the wall over the rod and your shoes will hang neatly. Outdoor Decor- Use the rods to hang holiday banners on your porch. 4th of July flags, Halloween spiders or paper lantern ghosts. You can also use them for Christmas light display or any hanging holiday outdoor decor. Crafts Display- For those of you with the crafty gene, tension rods are an amazing storage solution for ribbons, yarn, washi tape, wrapping paper and more. I use tension rods as my budget-friendly backdrop paper storage. Laundry Room- Whether you need extra hanging space or to cover an unattractive laundry sink, this tip will work for you. I don’t know about you but I spend most of my weekends in the laundry room, washing, drying, folding, ironing…you get the picture. I want that space to be welcoming and enjoyable, so I decided to spruce up the ugly laundry sink with a little curtain skirt. I used a tension rod which I attached to the sides of my washer and dryer (since the sink is in the middle) and I picked a simple linen curtain with some added texture to cover the extras under the sink. I placed a few extra rods in little crevices to add storage for extra hangers and any delicate clothing that air dries. Artwork/ Photo Display- For a custom look, spray paint the rods to the color of your choice and add curtain clips with rings. Hang anywhere you'd like to showcase your kids art work or fun photos. The great thing about this hack is you can easily change out the art as you please. Hope this post was helpful and some of these hacks will come in handy. 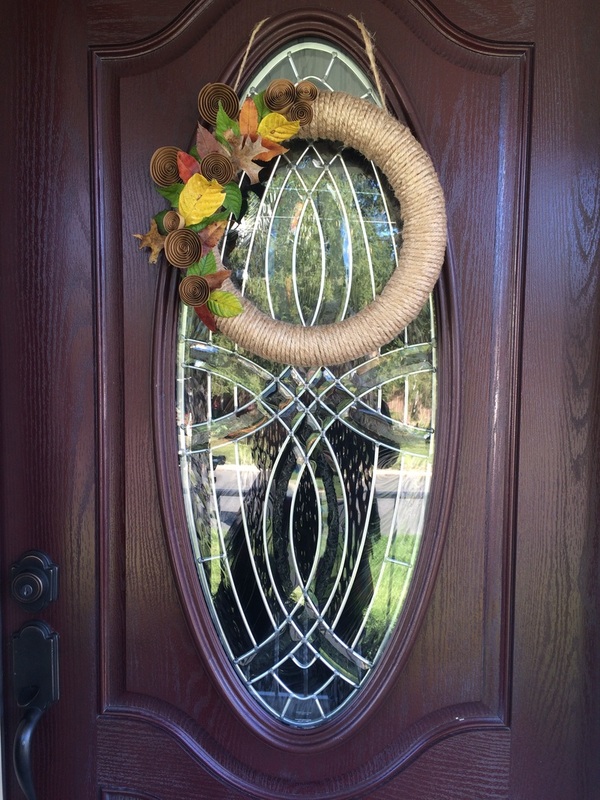 Show us how you use tension rods around your home and tag us on Instagram @dennison_dampier. I'm thinking a laundry room makeover would be a fun post. Let me know in the comments if you'd like to see that. Today’s Garden Buzz entry will be a DIY! Walking down the Fall isle at Home Goods made me want to start decorating for the season. This year we will be skipping the full outdoor Fall decorations but I still wanted my house to look season appropriate. Browsing through the store I spotted some beautiful wreaths. They had a great selection but I wanted something a little more unique, so I decided to use whatever resources I had in my back yard. Once I got home I started exploring the yard for some colorful foliage as well as anything else I thought would work. 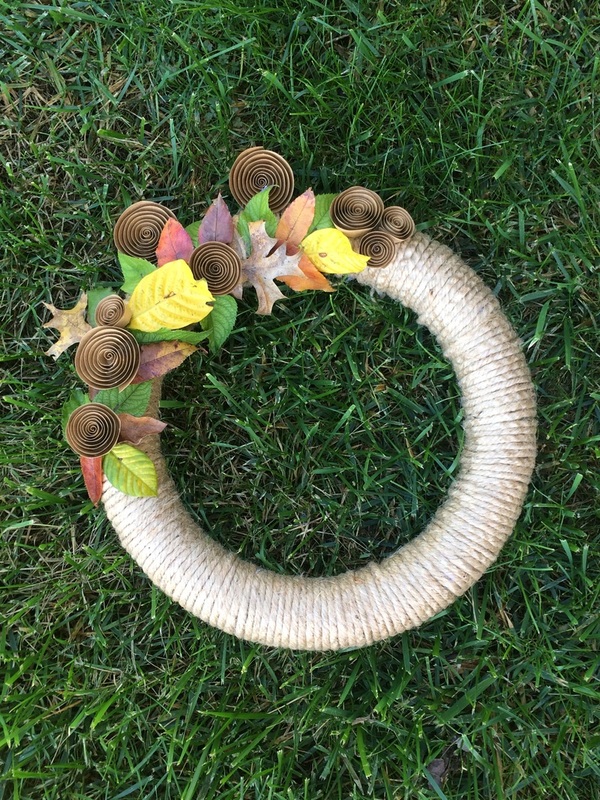 First, I hot glued the burlap rope around my foam wreath to conceal the actual foam. Then I started laying out my backyard finds in different configurations until I found the one I liked. Voila! The finished product looks better than I expected. I saw these swirl paper flowers at my local craft store and decided to make some of my own. (<-- Craft Level: EASY) Feel free to add some pumpkins on your porch for a more defined October look. Hope you enjoyed this little project and don’t forget to share your creations with us. Tag us on Instagram @dennison_dampier or Facebook. Do you have an empty wall in your house that you just don't know what to do with? Well here is a solution, make it into a gallery wall! ​Don't limit yourself to framed art work. 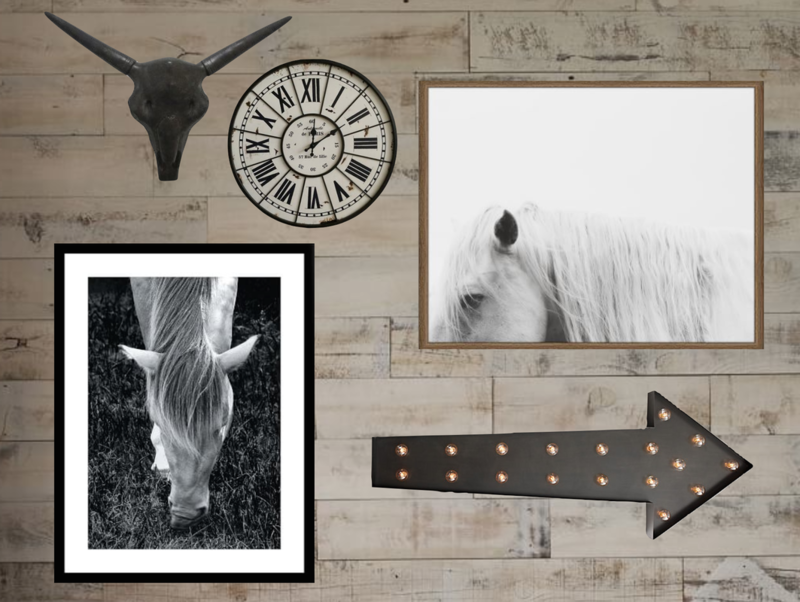 Use anything that can be hung to create a visual interest, make a statement, or be displayed as a conversation piece. Here are a few ideas you can draw inspiration from! On this wall we started with an interesting texture with the wood panels in the back. 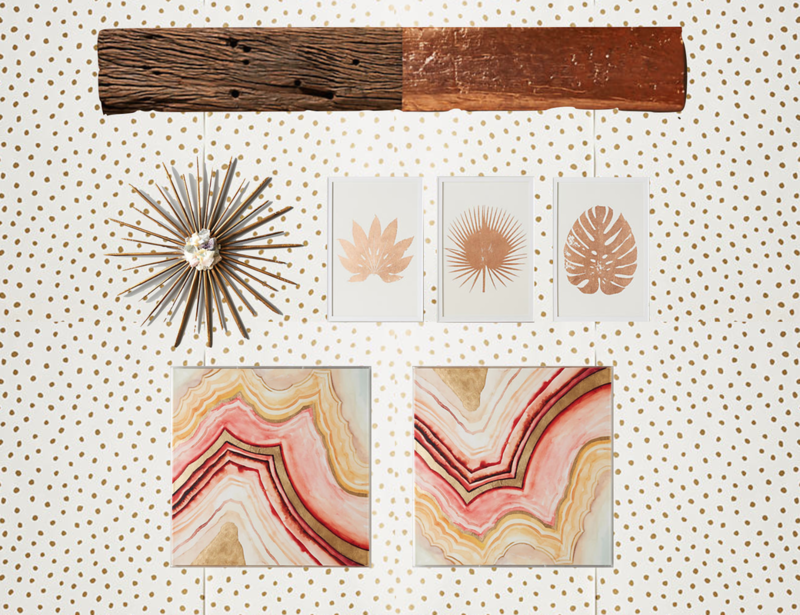 Mix the textures when it comes to the wall decor. Here I went with a mix of metals and metal texture. With this wall, we added a visual background using patterned wallpaper. For this I wanted a clean simple look of the wall decor since the wallpaper is so flashy. A modern feel with the use of clean white frames and calm photos. For this layout we went a little retro. Although we used metallic finishes we wanted to somehow incorporate nature. The large reclaimed wood block with half rose gold leaf finish was a perfect combination for the look we were going for. I can see this gallery wall in my own house. Of course you don't have to use wallpaper for these ideas. 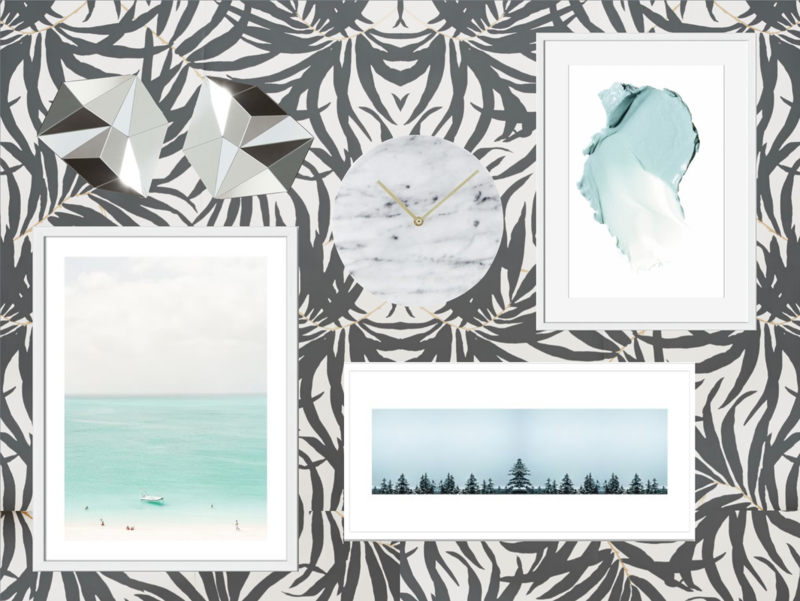 Feel free to create your gallery wall on any background that you wish. Don't forget to tag us on Instagram @dennison_dampier with your creations. We love to see them! Why do you hire a designer? With all the accessibility of products on the internet you might ask yourself why hire a designer? Can't I do this myself? When undertaking a large or small project it's the details that matter. 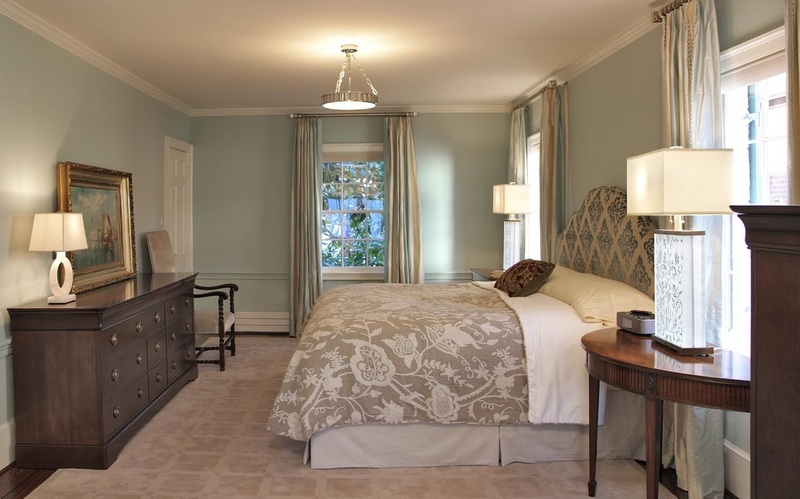 Lighting is critical, and so often overlooked when planning a room. Without the correct placement of outlets , recessed wall washers and task lighting your rooms will never look right. Lighting is what makes a room come alive. It should be subtle and deliver a feeling of well being. This involves doing a furniture plan and thinking abut all the different aspects and choices of lighting. Walls need to be washed with light to accent pictures, as well as important cabinet pieces and architectural details like mantles, bookcases and dark areas. They should not be the large recessed lights that give an ugly airport runway effect, but small and able to be swiveled to hit the walls at different angles. There have been so many strides made with the small 3" recessed LED lights now that run cool and don't need bulb changing often for years at a time. It's also important to have task lighting, lamps are a must, sconces add light at a different height and can be decorative or subtle depending on your preferences. Chandeliers are also an element that adds layers of light. Having lighting sources at different heights in a room is essential. Kitchen and bathroom lighting needs to be thought through very carefully. Lighting your face when you are putting on makeup, the correct height for sconces to achieve this as well as waterproof lighting in showers are essential. Kitchens need adequate under cabinet lighting for task areas as well as hanging pendants, say over an island or kitchen table. Recessed light should again be used to wash the cabinetry and walls. Just putting in lines of recessed lighting is not the answer and looks harsh, down lights make people look tired and are unflattering. Hope this helps in making the right choice for your home project. Let us know what you thought and leave a comment or follow us on Instagram @dennison_dampier. Decor & More: DIY Personalized Mugs! This is a fun and very easy DIY that can be personalized for any occasion. It makes for a great gift and an inexpensive party favor! Before you start drawing make sure to wipe down your mug with a wet cloth to remove any dust. Research a few clip-art photos of animals you like or phrases you'd want to use. Then get to drawing. Once you select the design you want go ahead and write it with the marker. ** If you mess up, don't worry! use the cotton balls and nail polish remover to fix any mistakes. After you are all done, place the mug in a cold oven and set the temperature to 425 degrees and bake it for an hour. Remove carefully when done and let it cool before using. Voila! A personalized mug just for you...or a friend. Organization 101: House Staging Tips! Hey! I'm sure you have already checked out the new service we provide, residential organization and home staging, but if not then go take a look under the Services tab. The links I have attached below have helped me develop my own staging and organizing style. Take a look at what I have learned from these pros to sharpen up my own skills. Get to staging and don't forget to tag us in your final reveals on Instagram @dennison_dampier and like us on Facebook!